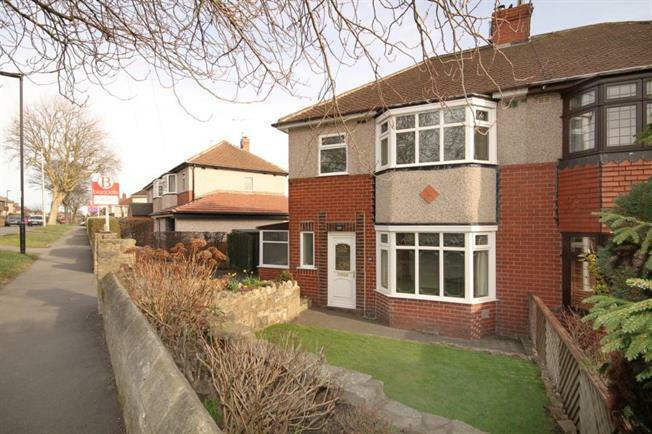 3 Bedroom Semi Detached House For Sale in Sheffield for £200,000. A superb opportunity to acquire with no chain this well presented three bedroomed semi detached home located in this highly sought after and convenient suburb. Offering accommodation over two levels with the benefit of double glazing, GCH, driveway, Conservatory, side porch/sun room, front and rear gardens and lovely views across the Loxley Valley to the rear. The accommodation comprises and entrance hallway with stairs to first floor landing, the bay windowed Lounge to the front with wood effect flooring and living flame effect fire focal point. The Kitchen and open plan dining area, is fitted with a superb range of base and wall units in a modern shaker style finished in cream with contrasting solid Granite work surfacing , coming complete with integrated Neff double oven, hob, extractor, Miele dishwasher tiled splash backs, window to the rear and French Doors opening to the Conservatory, Of half brick construction with Polycarbonate roof, wood effect flooring and French doors to the patio. To the side is a porch/sun room, with doorway to the rear and useful under stairs storage cupboard. On the first floor, the Master bedroom has bay to the front, carpeted with an excellent range of fitted wardrobes. Double bedroom two is carpeted with fitted wardrobe and window to the rear offering far reaching views, Bedroom Three provides flexible accommodation as a third bedroom, study or nursery. The Bathroom has three piece suite comprising WC, wash basin with storage cupboard and bath with shower over. To the exterior of the property is a driveway providing off road parking, garden to the front, and garden area to the rear comprising a stone flagged patio providing an excellent outdoor seating and entertaining area, lawn and garden shed.